I started this piece based on a sketch I made last week. Never mind the plaster corner on the northeast, I replaced a standard tile for testing. I'm going to detail it to semi-realistic, but before that I want to get shading right. The matter is that I'm not knowing how to shade it. I know my main light source is the window (whereas it's a daylight), but theory is punching practice on the face. This a3um's Study is kind of a inspirational piece, always when I think sun rays and shadows I remember those dust pixels on the light and I drool. I also assumed that the window is the one and only light source, so if there's an overhead light or anything you'll have to adjust for that. Also, google sketch up is a free program and fairly easy to make simple structures. You could do a mockup in a few minutes and the change the light source to whatever you need. It might prove very useful to you. Hey ho! Oh, my brain knew that something wasn't right on those walls, it really goes much better being darker. I made some improvements following your explanation, moreover thank you for that and for your edit. I think now shadows are taking shape. 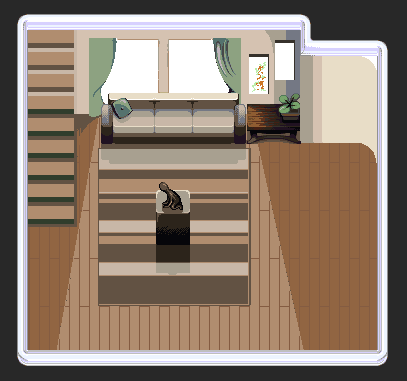 Btw I'm not very happy with the couch's empty top, maybe I'll add some curtain fabric over the left side of it to deceive a little bit (or maybe not). Should I change something or I keep going? I find the intense stripes on the carpet disturbing in the sense that it doesn't look like a flat carpet (more like rails for some huge machine). Maybe less contrast or narrower stripes would help to recognize it as a carpet at first glance. I don't know much about lighting, but I'm not a fan of having the wall that pops out (right one) a darker color than the background wall. I also find the shadow gradient along the wall weird... If you're gonna go with it, I think it should be a much more subtle change. 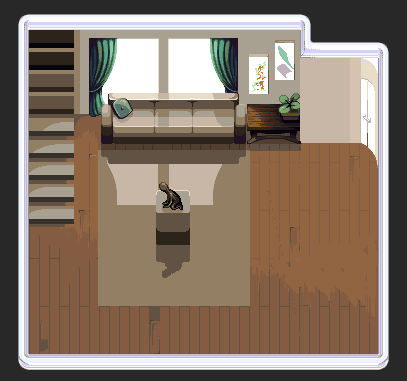 I assumed the room was well lit, but if you want an old empty house a la a3um's pixelart, the darker point of the room would be the far right corner, which wouldn't receive direct lighting (only a bit of rebound from the room). The 'middle' corner (which you had most heavily shaded) would also be dark, but not as much as the far right corner. 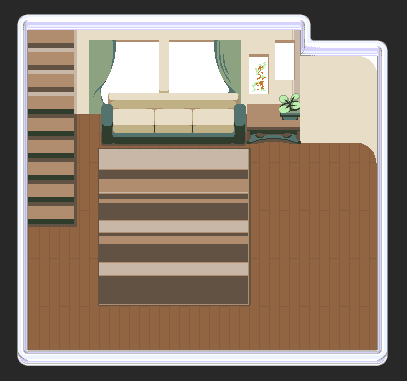 Tapsu, I pretend to make some texture for the rub/floor/stairs. (: Nevertheless if it continue to not read very well then I apply vertical bands or a pattern. YellowLime, you're right about the walls. I tried a darker color there and I think it's better. It probably will have a natural glimmer coming from the door from the bottom, but the big windows are the main light source anyways. 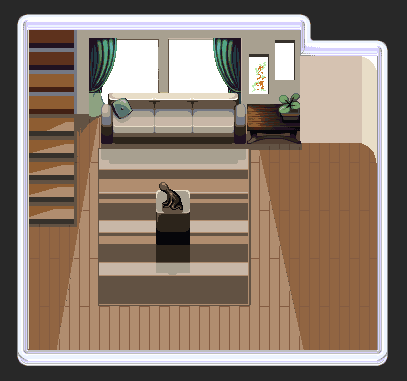 I fixed some things, started to work on the curtains and sketched some angled shadows on the stair steps. I think the upper steps wouldn't have angled shadows, do they? Speaking of the sofa and statue shadow extent, I'll try to do something about it. Thank you. There are two types of lighting: direct lighting and indirect lighting. With indirect lighting, the light through the window is reflected light and is coming from all directions, so you would have soft shadows that only loosely follow the shape of the object that casts the shadow. Stava, that's an awesome edit. I made some adjustments based on your thoughts, thank you. Also I changed the intensity of the light source and removed the previous rub bands, I'll try to do something different on it. oh, quick note. Shadows do not multiply if there is only one light source. 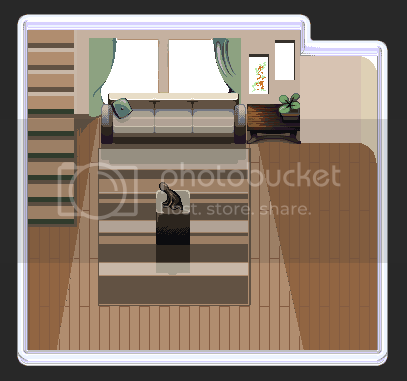 So the shadow of the window running over the sofa should all share the same value, instead of being banded like they are now. This is actually pretty well represented in the previous edits that Stava and Nameless Force made.